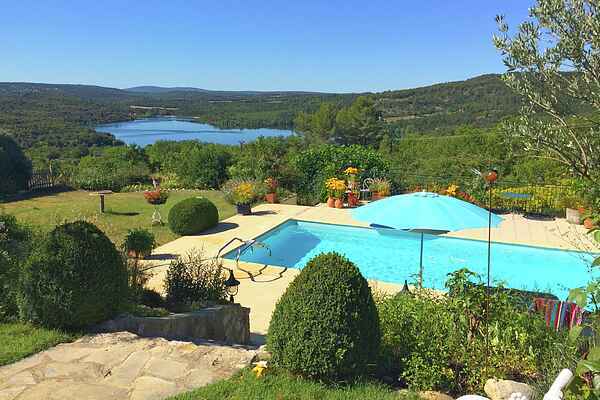 Wake up in the morning with a nice cup of coffee on the patio, enjoying the stunning views across lake Le Verdon and its surrounding landscape - a perfect start of your day! The hous is situated in a lovely spot on the border of the Var and Alpes-de-Haute-Provence regions. The well-maintained, 2,000 m2 garden consists of colourful flowers, a large lawn and various terraces from where you can admire the amazing views. The beautifully landscaped garden also hosts a saltwater swimming pool, which can be heated for an additional fee. The peaceful surroundings ensure you'll find tranquillity here all the time. Your location is perfect for numerous excursions. Montpézat for example, is a typical Provençal village, situated at the beginning of the Gorges du Verdon. And there are plenty more villages in the vicinity with picturesque old houses and attractive outdoor cafes - all great places to enjoy the lakes and the various water sports activities on offer. Canoe down the wild ravines, characterized by unspoiled nature. Around 20 km away, you'll find the authentic village of Moustiers-Sainte-Marie, listed as one of the most beautiful villages in France, set in the Parc Naturel Régional du Verdon. If you're here in spring, remember to take the Lavender route through Valensole and soak up the wonderful colours and scents of the lavender fields. For tennis lovers, the well-maintained tennis court is a few meters from the villa. Via a suspension system, you can enjoy playing a game of tennis. .